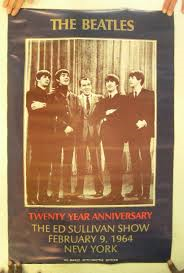 I've not said a word about the 50th anniversary of the Beatles' first appearance on the Ed Sullivan Show. It's hard for me to write about the impact of the Beatles on my life. It's not something I can cover in a blog post, and I'm not actually 100% sure I'm a good enough writer to tell the story of what this band has meant to me. So I've decided to save it for the book. If there's never a book, someday I'll write it down as if there were. But I'll tell you an anecdote. 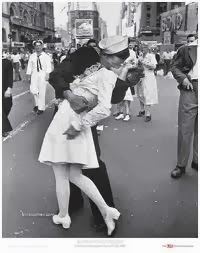 In our senior year of high school, Bestest Friend had a poster on her bedroom wall that commemorated the 20th anniversary of the Beatles' appearance on the Ed Sullivan Show. In fact, it was this poster, and Bestest Friend, this image is from an eBay auction listing it at $149. Just saying. Back in 1984, 1964 seemed like a very long time in the past. After all, it was before we were born, which automatically denotes ancient history. Shown here: the dawn of time. And now it's been 30 years since the 20th anniversary. And 30 years since my senior year of high school. It feels like nothing. Yet the 20 years between 1964 and 1984 still seem like a tremendous chasm in time to me. Proving that time is nothing less than black magic and you need to have a TARDIS and sonic screwdriver to even begin to understand it. So happy 50th anniversary, Paul and Ringo. I miss you, John and George. Also, happy birthday to my big sister, which to me is even more worth celebrating. La la the time moves on. I'm not a particular fan of the Beatles, I'm afraid: my tastes tend more towards the Iron Maiden end of the musical spectrum. Still and all, at least they could sing. Unlike some.